When we saw ace wedding photographer Richa Kashelkar’s recently added wedding Nirvi and Neel – held at Tote on the Turf, Mumbai – we were sold the minute we read the photographers experience with an off-beat bride like this one! This stunning bride Nirvi, took the no-fuss, no-stress process. This Mumbai wedding was all about the love! A bride who wore sneakers under her lehenga for the sangeet cause “why would anyone wear uncomfortable footwear that’s not going to be seen anyway? Also, I really want to dance today”- says Nirvi - GAME POINT. From choosing to dance to Prabhu Deva’s Muqabala at the Sangeet ceremony, to having NO mehndi on her arms cause she just didn’t like it – Nirvi has set a standard with her do-only-what-you-love mantra wedding! Tote on the Turf, Mumbai saw this couple’s wedding in all its raw happiness. #ThisIsTheN – A wedding hashtag as trendy as this couple. What made this couple amazing was also the contrasting personalities Nirvi and Neel shared. While this bride was all-out drama with the right amount of sass, Neel was gentle, kind and a little bit clueless. Always smiling, always slightly confused about what’s going on since he’s an NRI and so so charming. Minimal jewellery, a gorg gota gown and side braid – Nirvi’s cocktail outfit was all kinds of stunning! Nirvi didn’t fuss about everyone lathering her with haldi from head to toe but rather ran around hugging them later. No floral jewellery or fancy designer tags on this one! 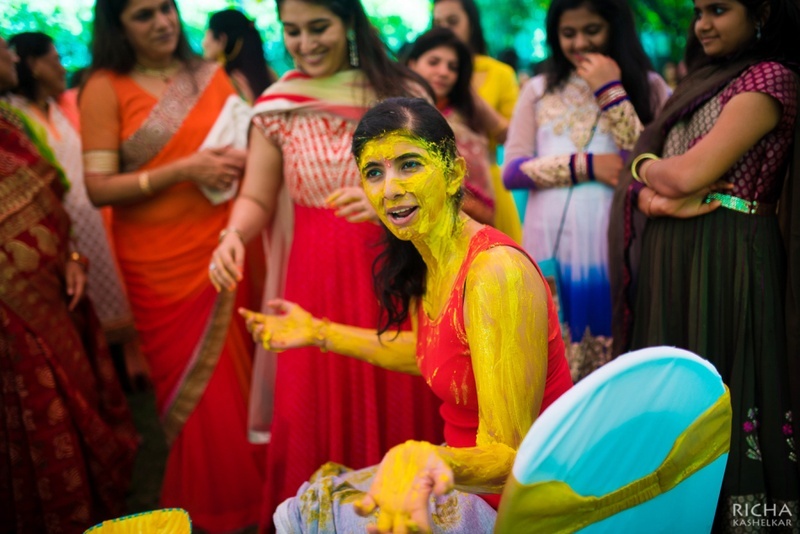 We love brides that set themselves apart from the crowd – Nirvi was one such bride. Her no-mehndi bridal hands and comfy footwear choices (yup, she wore sneakers!) and constant crazy expressions had us in-love with her. Neel danced at the sangeet and his parents said that was the first time he had ever danced in his life! The only time I heard anything about Neel was when his friends gave speeches extolling his generous nature, and they unanimously echoed what we all had seen very evidently by then- Nirvi and him bring out the best in each other, and they both haven’t been spotted happier than when they are together. This wedding showed us what a wedding should be – way above the superficialities of the lehenga, décor and mandap. Nirvi and Neel’s wedding focused on just that. Only the love and nothing beyond!